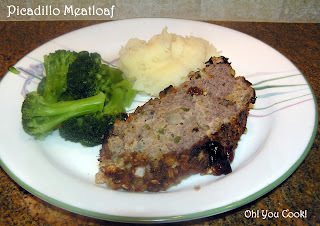 Here is a meatloaf with two surprise ingredients: oatmeal and raisins! Yes, oatmeal and raisins are not just for breakfast anymore. The fact that oatmeal and raisins are the required ingredients for October's Improv Challenge, hosted by Frugal Antics, is merely a coincidence. Totally. Picadillo is a cuban-style version of sloppy joe, with extra spices, raisins and green olives tossed in. To make it less sloppy and more loaf-like, binders were added. 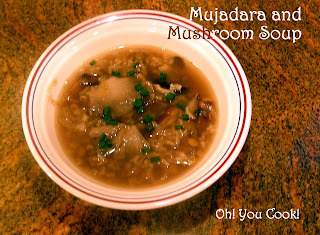 This one uses the usual egg, plus oatmeal for the sake of the challenge. A big thank you to all those gluten-free sites that suggest oats in place of bread crumbs. By the way, if you are cooking for someone gluten-intolerant, be sure that your oatmeal is not contaminated with gluten cooties. Even Quaker Oatmeal, which says on its label that it is 100% oats, contains trace amounts of gluten due to cross-contamination. I wasn't feeling very well today. It might have been from way too much partying at the bat mitzvah (the female version of a barmitzvah) of theHubby's 3rd cousin ... yes, wide age range there. Many friends and relatives, including third cousins once removed and even 4th cousins (I think) were at the Saturday morning service and soiree later on that evening. Mazel tov, Jenna! Ow! Too much yelling in that last sentence. Or it might have been the chicken sub from the local OyVay on Sunday in between major retail therapy at the shopping outlet with my high school buds. But I digress ... in any event the hurt waited until first thing Monday morning. My tummy and head weren't anywhere near normal. Breakfast consisted of a cup of chai. Work turned out to be a failed attempt. It wasn't until after a hearty lunch of buttered toast that I finally started to feel a bit better.